Bethpage Water District has been delivering an uninterrupted supply of the highest quality water to customers since 1923. As one of the most experienced Districts on Long Island, we are fully committed to achieving environmental excellence and providing unparalleled service, while maintaining some of the lowest water rates in the United States. The District places a high priority on maintaining our system infrastructure, while constantly meeting or exceeding strict state standards concerning water quality. 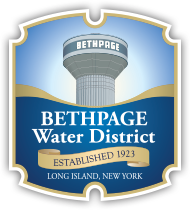 This website contains important information about the Bethpage Water District, as well as items of interest such as water conservation tips, water quality reports, billing information, ordinances and general news. We hope you find this site to be informational and educational. As always, please feel free to contact us if we can be of any further assistance at (516) 931-0093.